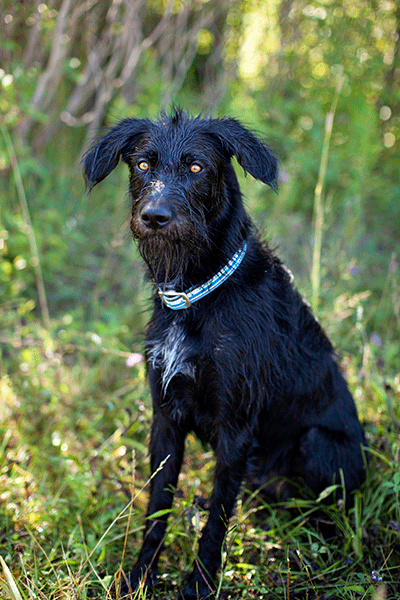 Pointing breeds belong to the Sporting Group and include the English Pointer, Brittany Spaniel, the 3 German Pointers (Shorthaired, Wirehaired & Longhaired), Vizsla, Weimaraner, Italian Spinone, the 4 Setters (Irish, English, Gordon, Irish Red & White) and the Wirehaired Pointing Griffon. There are other breeds but for the most part the others are very rare here in Canada. Does a Pointing breed fit your lifestyle? Pointing breeds are all-purpose gundogs bred to hunt alongside their hunter with enthusiasm, intelligence and drive for hours at a time. These breeds therefore tend to be high-energy dogs with a requirement for both physical and mental outlets. Do you need to be a hunter to have a Pointing breed? Absolutely not! Many lucky families have one of these breeds as part of their life, but an appropriate lifestyle is key to enjoying your Pointing dog. Most of these dogs need a little more exercise than other breeds so a one hour leash walk through the neighbourhood isn't going to cut it. Your dog will need a combination of lots of off-leash running time combined with the mental stimulation that comes from training. Most Pointing breeds are well-suited to competitive sports such as agility, obedience, rally obedience, dock diving and more! They love to learn and love having jobs. They make excellent hiking partners and after a day of fun with your dog, they also make adorable couch potatoes. If you have any questions about Pointing breeds or about any of the dogs we have available for adoption, please contact us!